I want to change the email address from which I log in. Normally I enter an email address and a password to login. I want to change this email address "ID". There is no option to change my email address. I do not want to use any of these "credential options" because I do not want (for example) Google collecting information on me. Note that I am not talking about my profile email address which is different than my login email address. I want to change the LOGIN email address. Based on the linked question in the comment I was able to figure out the answer. Unfortunately, the linked answer does not give sufficent details and leaves out some key points, so I am posting an answer here that completely answers the question. This mostly pertains to people who have legacy email address accounts. In the old days Stack Overflow supported email-address / password combinations. It no longer does, nor can you edit or change the email-address associated with your legacy login (huh?). Therefore, you have to create an alternative "credential" to login if you no longer want to use your legacy email. Note that you can have multiple "credentials", so you can both keep your legacy email and have the new credential if you want. The closest thing to a private login currently is "OpenID". The process below describes how to do it. Click the menu choice "Register"
Enter the email address and password you desire in the boxes. You must enter it twice as a typo prevention measure. Note that the password security constraints are significant. It may require you to solve a CAPTCHA, too. When this is done, it will direct you to confirm the ID via email. Go to your email account. You should have received an email from OpenID asking you to confirm the account creation. If you did not, check your spam folder. Click the verification link in the email. Click "Edit Profile & Settings" profile menu choice. The profile actions menu is in the body of the page. On the left hand side of the page is a navigation area. In the "SITE SETTINGS" choices, click on "My Logins". This page should show your legacy login (and any other login credentials you have). Click "add more logins..." This will take you to the screen I have screen captured above in my question. 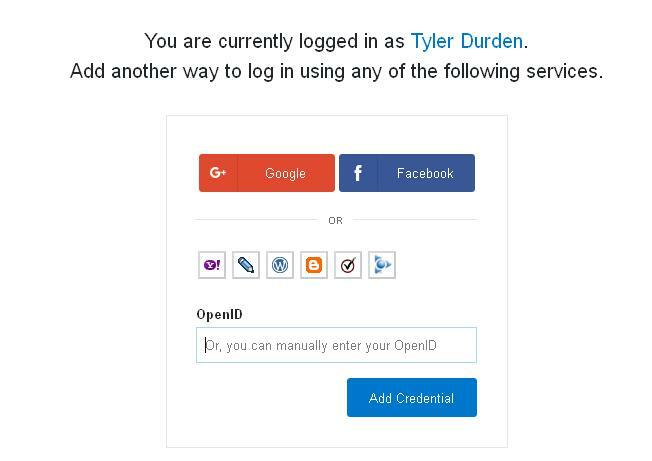 Enter the following URL into the OpenID text edit box: https://openid.stackexchange.com/ and click "Add Credential". Enter the email address and password when prompted. This should add the new OpenID credential to your logins and you can now login with that credential. Note that you can delete the legacy email if you want and are satisfied that the OpenID is now working. Note that if you have serious account problems, like having your account linked to an email address that no longer works, or you need to merge multiple accounts, Stack Exchange has administrators that you can contact to fix these complex problems. How to change e-mail address on Stack Exchange / Stack Overflow sites? How do I change password of my account? Is it safe to remove my Stack Exchange login?